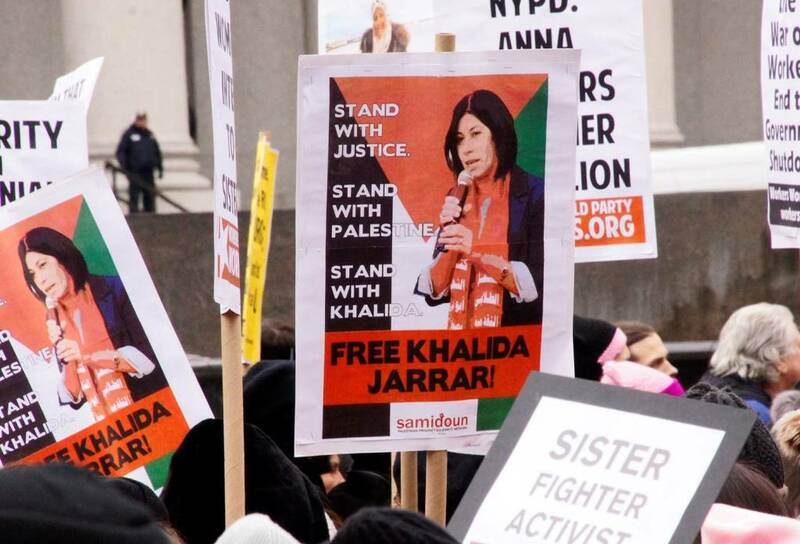 Samidoun Palestinian Prisoner Solidarity Network joined with other advocates for Palestine to organize a bloc in the Women’s March in New York City in solidarity with Khalida Jarrar and Palestinian women prisoners in Israeli jails. The Samidoun bloc joined the Women’s Unity Rally at Foley Square on Saturday, 19 January, carrying signs urging freedom for Jarrar, the imprisoned Palestinian parliamentarian, leftist, feminist and political leader, held without charge or trial under administrative detention. The Women’s March had been attacked in previous months, especially by Zionist groups. While they ostensibly raised concerns about antisemitism, the most prominent issue at hand seemed to be criticism of Israel, opposition to Zionism and inclusion of Palestinian women. An “astroturf” group called “Zioness”demanded the inclusion of Zionism in the Women’s Marches and the feminist movement, while Black leaders of the march were attacked and accused of anti-Semitism. While allegations of support for Min. Louis Farrakhan were often invoked in these charges, the real issue seemed once again to boil down to support for Palestinian struggles. This echoed simultaneous attacks on Marc Lamont Hill, fired from CNN for defending Palestinian rights, and Angela Davis, stripped of a civil rights award after Zionist groups denounced her solidarity with Palestine. In New York, an organization calling itself the Women’s March Alliance yet separate from the national Women’s March and its leadership secured the parade permit, but refused to include national organizers or other city activists. The organizers of this event in Central Park affiliated themselves with Zioness and encouraged people to carry Israeli flags in the march. On the other hand, the Women’s Unity Rally in Foley Square worked with the national organizers under attack as well as the New York Immigration Coalition and a range of labor and social justice groups. The Foley Square march also included a Jewish contingent that included Jewish Voice for Peace and a Jews of Color bloc, as well as Gabriela New York, the Filipina women’s movement organization. 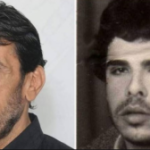 Palestinian women prisoners, including Jarrar, have been on the front lines resisting elevated repression inside Israeli jails. Israeli minister Gilad Erdan, also responsible for the government’s global anti-BDS campaigns under the Ministry of Strategic Affairs, some of which were detailed in Al-Jazeera’s unaired series “The Lobby,” has sought to roll back achievements won through years of struggle in Israeli prisons. This has included cutting prisoners’ access to water, denying them family visits and installing surveillance cameras in the women prisoners’ recreation yard. 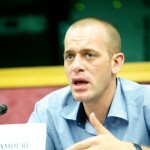 Erdan and others have been using attacks on the prisoners as a method of campaigning for votes in the upcoming Israeli elections. 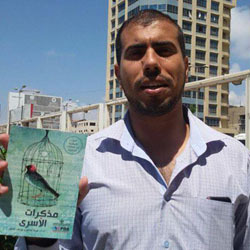 Jarrar, the former Executive Director of Addameer Prisoner Support and Human Rights Association, has been imprisoned since July 2017 without charge or trial. Her administrative detention has been repeatedly renewed on the basis of so-called “secret evidence.” The contingent in the Women’s March highlighted her case as a critical example for international support and solidarity to demand her immediate release and the end of her administrative detention. 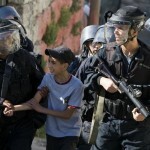 Protesters emphasized the importance of supporting Palestinian women’s struggle and the liberation of all of Palestine. 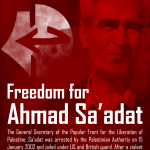 The contingent was also part of the Week of Action to Free Ahmad Sa’adat and all Palestinian prisoners, with events taking place on Saturday in Berlin, Manchester and Nottingham. 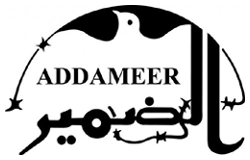 Another forum on solidarity with Sa’adat and the Palestinian prisoners will take place on Thursday, 24 January in New York. This entry was posted in News About Prisoners. Bookmark the permalink.